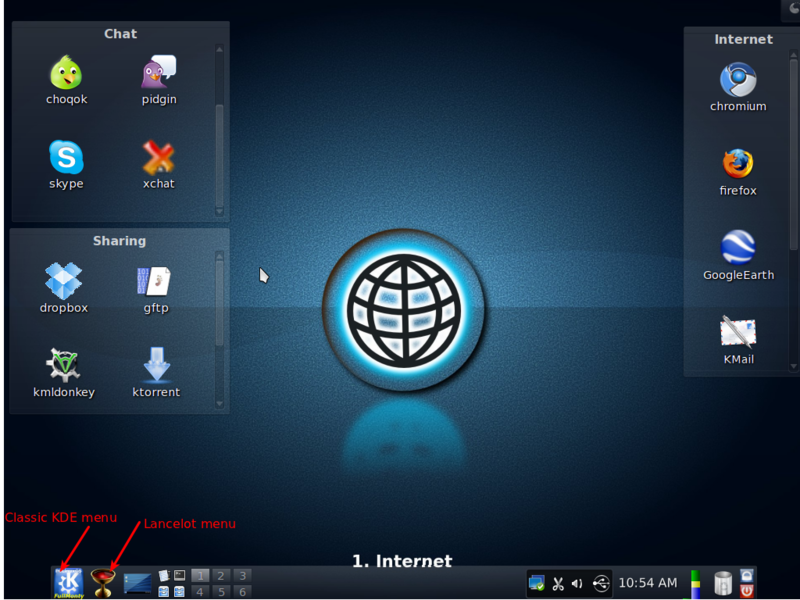 PCLinuxOS is a (Linux) distribution that was derived from Mandriva Linux. It is a rolling release distribution, which means that once installed, updates are continually made available so that re-installation or upgrading when a new ISO image is released is not necessary. The project makes installation images available for all major desktop environments. Three versions of the KDE edition have been released. 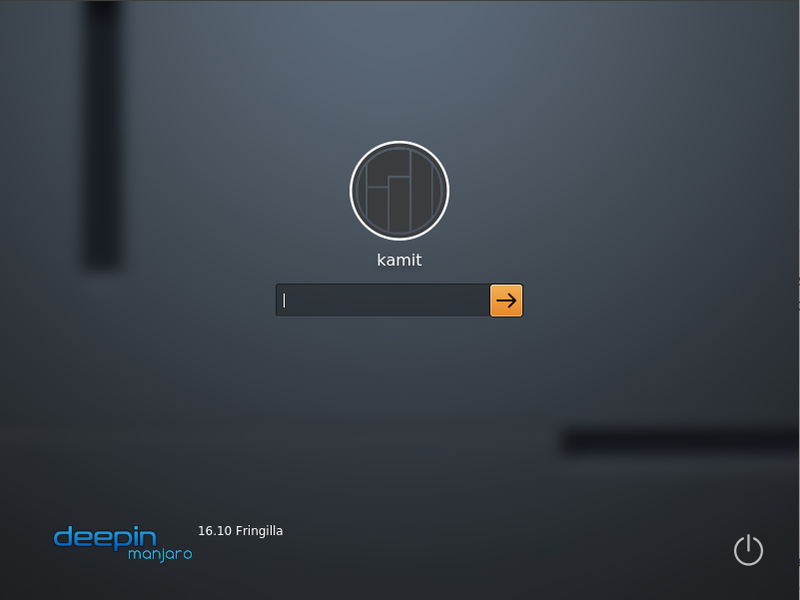 The last one, PCLinuxOS 2011.6 KDE Mini, was released just yesterday. The others are the standard KDE version and what is known as the FullMonty edition. 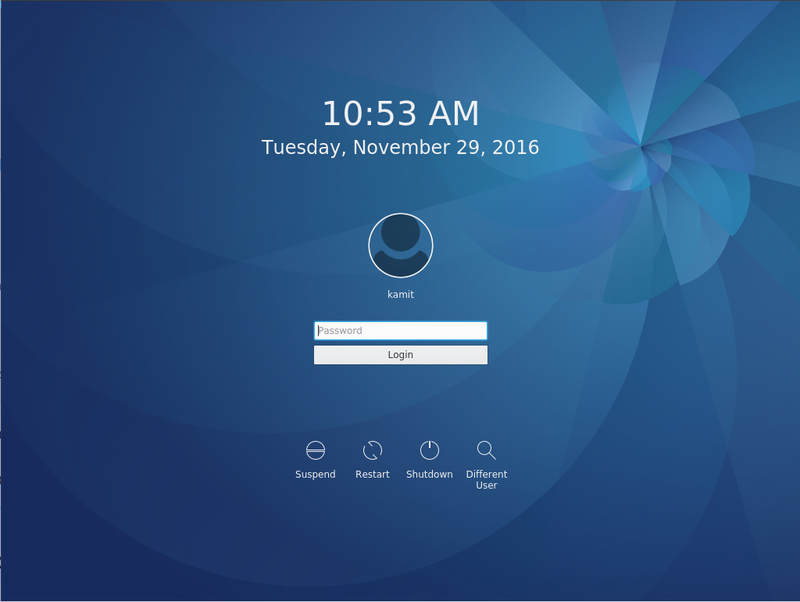 This article is a review of the standard KDE edition, which was released in June, with some commentary and screenshots on FullMonty. 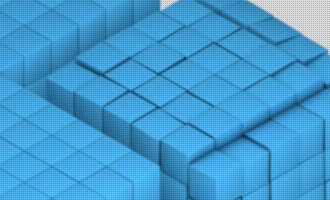 KDE Mini is a bare bones edition, designed for advanced users or those who want to install their system nearly from scratch. Nothing more will be written about it in this review. The installation image is a Live CD image, with an option to install to hard disk in the boot menu. This is a feature I suggested in a review of PCLinuxOS 2010. 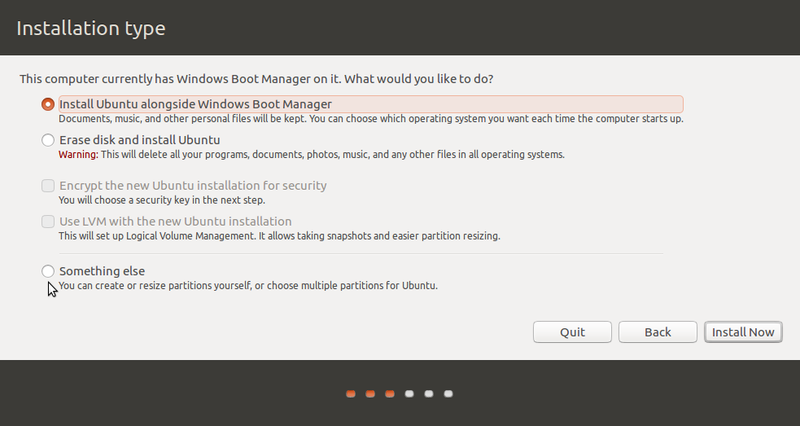 So, you may start the installation from the Live desktop or directly from the boot menu. 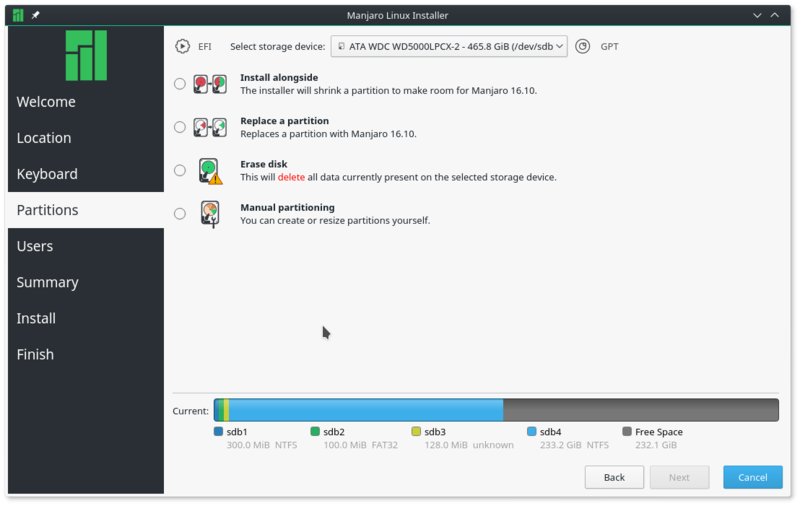 Installer and Installation Process: PCLinuxOS uses the same installation program available on Mandriva, the distribution it was derived from. On the last version reviewed on this website (see PCLinuxOS 2010 review), I wrote that attempting to install PCLinuxOS on an LVM partitioning scheme is like a crapshoot because you never know if it will work. In fact, I have never succeeded in installing it on LVM, except with this release, where it worked on my first attempt. Whether that was pure luck or that the LVM script has been fixed in PCLinuxOS is something I do not know. LVM, by the way, is the Linux Logical Volume Manager. 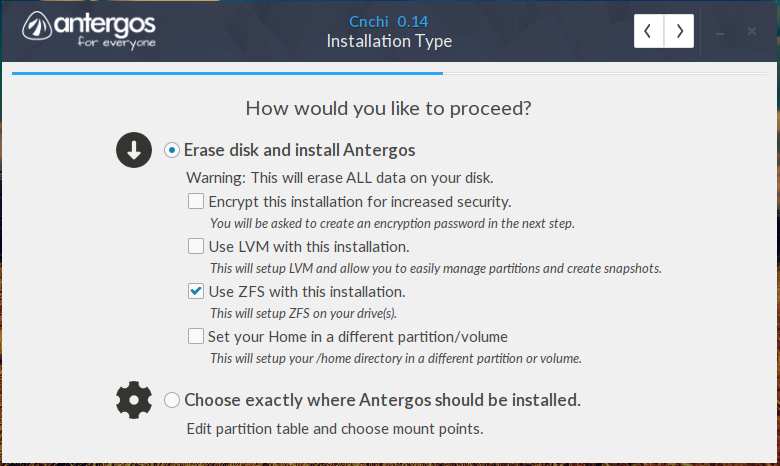 A known weakness in the installer is the lack of a “Back” or “Previous” button at critical steps, especially during the disk partitioning phase. This is also the case, even in the latest release candidate of Mandriva 2011. 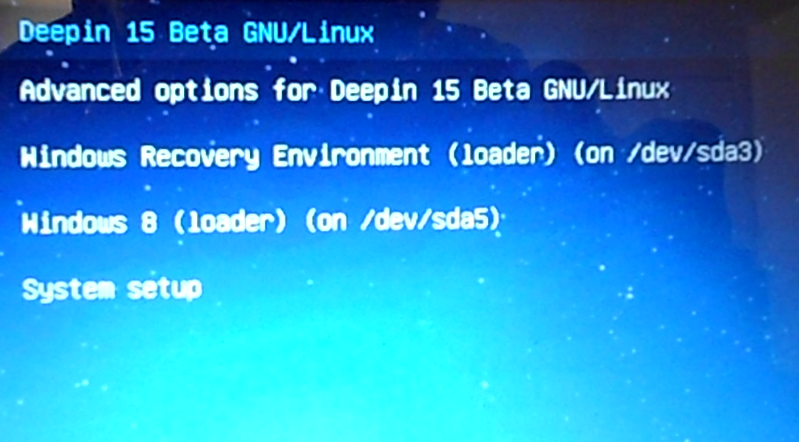 Other than LVM, the installer also has options for setting up RAID and installations on encrypted disks. Whether those two options work or not is something I did not attempt to verify. 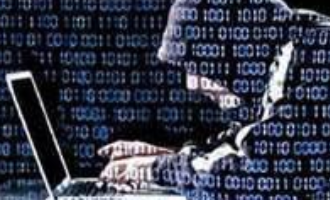 There is an ongoing discussion on the PCLinuxOS community forum about installing PCLinuxOS 2011.6 on an encrypted disk that is attempting to ascertain the possibility of a successful installation of PCLinuxOS 2011.6 with disk encryption enabled. Update: You might be interested in how to install PCLinuxOS on an encrypted LVM file system. A new installation of the standard KDE edition takes up about 2.7 GB of disk space, while the FullMonty edition uses more than a whopping 12 GB. More on this further down. 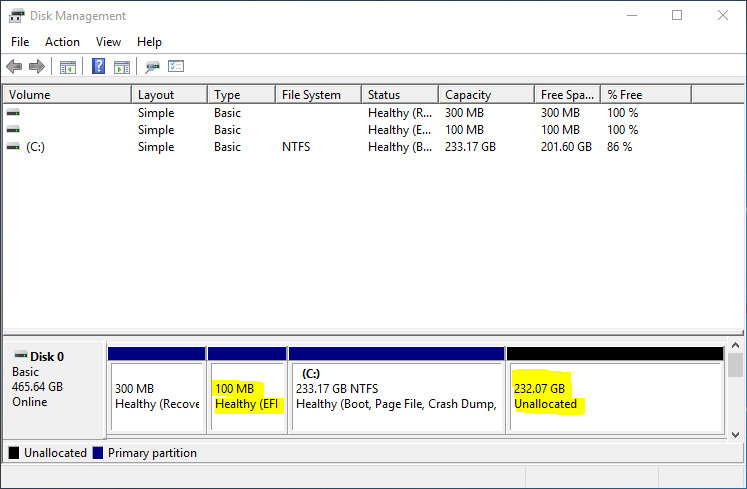 By default, the installer creates three partitions – one each for /, Swap and /home, with ext4 as the default file system. 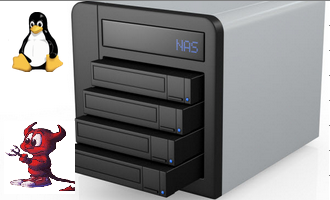 Ext3, xfs, jfs and reiserfs are the other file system options. Btrfs and nilfs2 are available only when in advanced mode. 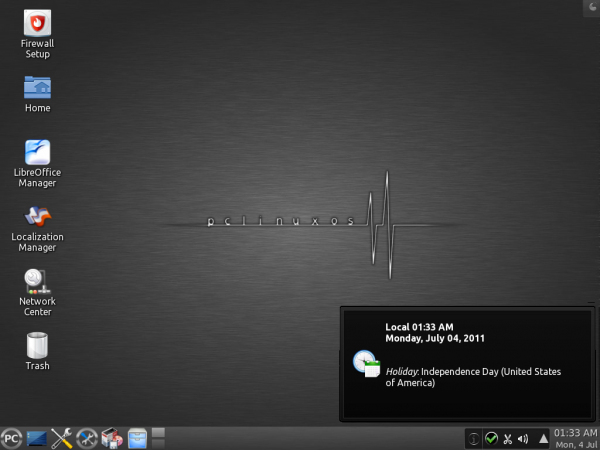 Desktop: When it was released, PCLinuxOS KDE 2011.6 was powered by KDE 4.6.4. Since then, KDE 4.6.5 has been released, and I was able to apply the update – manually, of course. The default desktop sports the classic KDE menu, but switching to the Kickoff menu is just a 2-mouse click operation. The KDE Control Center, Synaptic Package Manager, and the PCLinuxOS Control Center all have icons on the panel for easy access. This is a screenshot of the KDE Plasma Netbook interface. 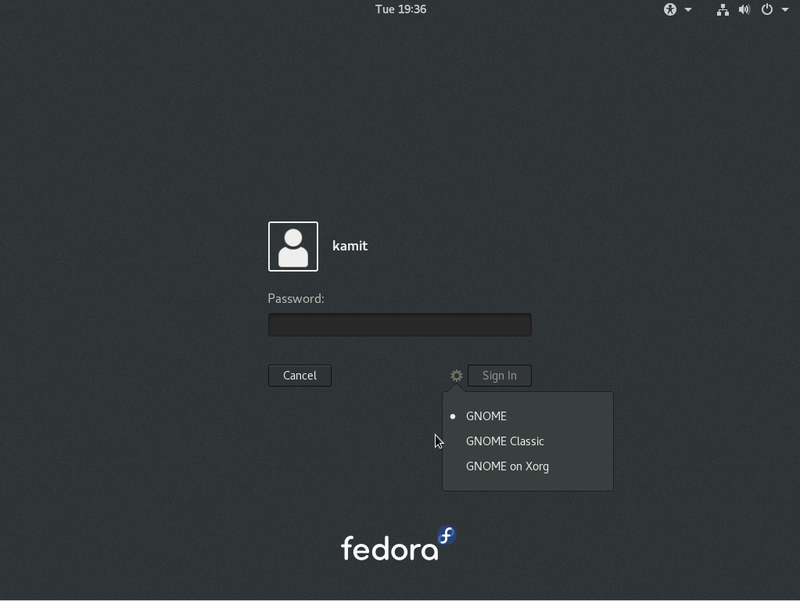 The polished metallic finish of the KDE Plasma Desktop interface looks cool, but not this black, at least to me. Like every KDE edition that I have reviewed, there was no attempt to customize this interface to more closely match the default desktop, especially with respect to the applications in the Favorites pane. I thought about doing a separate review of the FullMonty edition, but decided against it. As its name implies, a default installation of PCLinuxOS FullMonty ships with just about every application you can ever imagine. That is why it uses more than 12 GB of disk space, which is more than four times as much space used by any other Linux distribution that has been reviewed on this website, and nearly twice as much as used by a new installation of Windows 7. 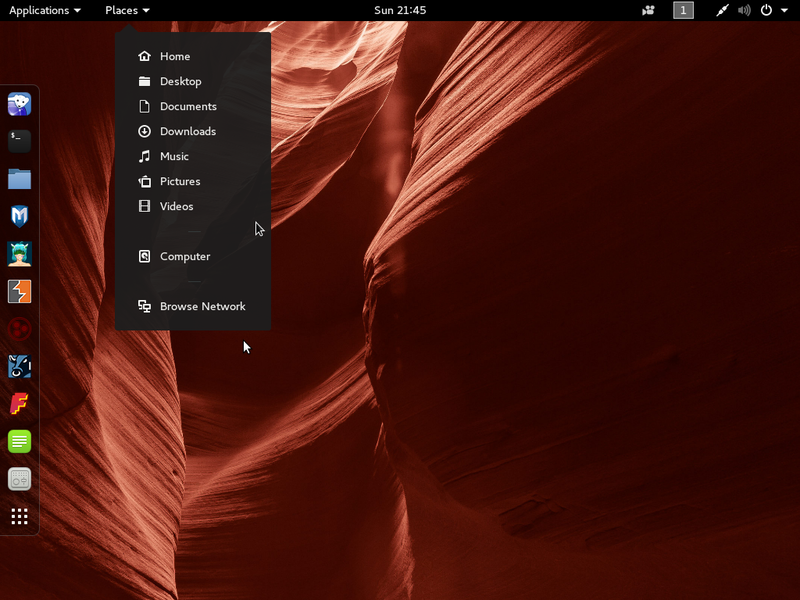 Rather than the customary four desktop workspaces on Linux desktops, FullMonty comes with six, each with a unique set of widgets and applications geared for specific tasks. This is the default desktop, which just happens to be the Internet workspace. (You may view screenshots of the other workspaces here.) 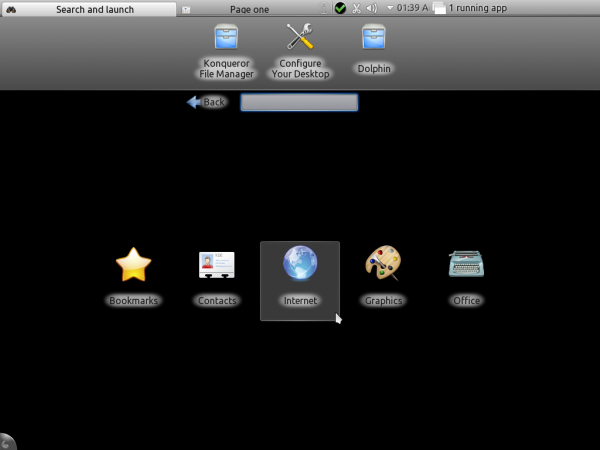 Like the other workspaces, the applications are separated into widgets based on functions. What I find truly baffling about the default (FullMonty) desktop is that the panel sports two menu styles – Classic and Lancelot. FullMonty, according to its official description, is “designed to address typical user-needs/tasks … and provide the best out-of-the-box experience in an intuitive, thematically organized desktop setup.” I think it falls far shy of that objective. For a new user, it provides a confusing assortment of applications. And the wallpaper does not do it any favors. 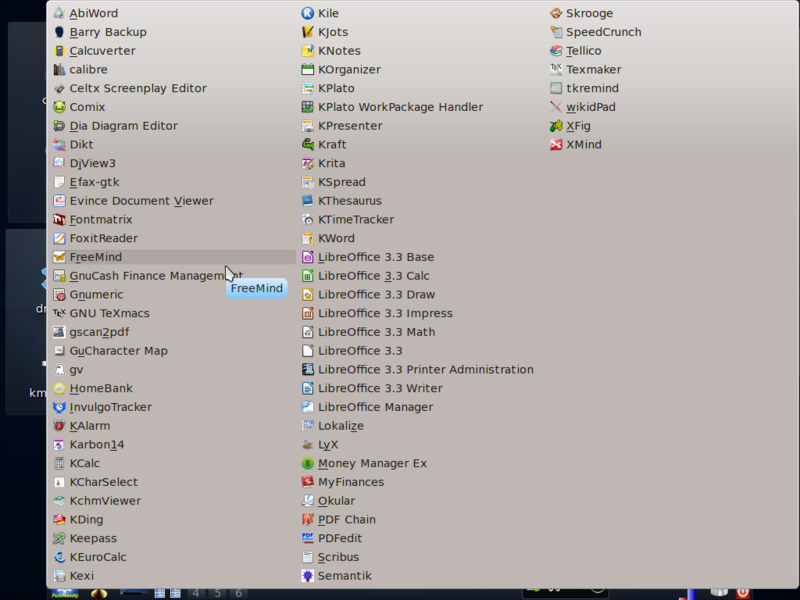 This is a screenshot of the default desktop, showing the applications in just the Office category. The other application categories are similarly packed. 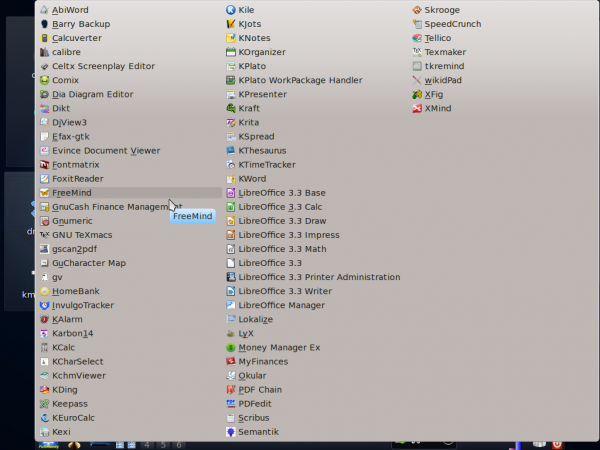 These are besides the stock KDE system tools, utilities and desktop accessories. There are no games installed, but there are more than 150 available in the repository. Aside from the installed Firefox Web browser, Opera 11.50, the latest stable edition, and Chromium are available. The latest stable version of XBMC, the media center application, is available for installation. With Adobe Flash plugin installed, Firefox and any other Web browser you install will render any Flash content, but fail the Java test because a Java Runtime Environment is not installed, even though the Sun Java plugin is in the repository. Also, VLC, the installed video player, is unable to play encrypted video DVDs. Like the Java JRE plugin, libdvdcss2, the library needed for playing encrypted video DVDs, is in the repository, but not installed. Even in the Fullmonty edition, where everything, including the kitchen sink, is installed, libdvdcss2 is not. PCLinuxOS 2100.6 ships with all the necessary hardware drivers, so it should work on most hardware. Worked flawlessly on mine. I think why the screen background is plain black in the netbook view is because the horos background doesn’t exist out of the box, and because that view was never customized it tries to look for it. & usually find an answer before asking a question. I’ve been using PCLOS for about 5 yrs & have had my share of problems usually self inflicted but found it rock solid for what I do. I was thinking about trying out Ubuntu so went to the forums & got totally turned off by the attitude & maturity level of the people. To Hell with that. I think I’ll stay where I am. I agree… I am using PCLinuxOS 2011.6 right now and the security is really bad on it. It does not show a new user how to set up a general firewall. which is very important for new users as well as advance users.